Authorities in Allentown are seeking help from the public to locate a 16-year-old high school student and a 45-year-old married man who appear to have gone missing together on Monday morning. 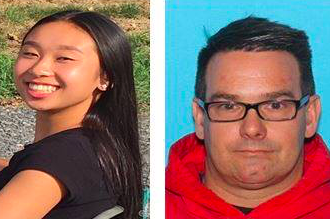 Police said Amy Yu and Kevin Esterly were reported missing Monday and may be traveling together in a 1999 Red Honda Accord with the Pennsylvania plate number "KLT 0529." Investigators said both could be endangered. The Morning Call in Allentown reported Wednesday that Yu, a student at Lehigh Valley Academy Charter School in Hanover Township, had been checked out of the school by Esterly 10 times between November and February, according to court documents. Yu and Esterly reportedly have a "secretive relationship," court documents said, and the parents of the girl appear to be familiar with Esterly. The CEO of Yu's school told The Morning Call an investigation is underway to see whether protocol was followed on the numerous occasions the girl was picked up by Esterly. It appears Esterly's wife is also familiar with Yu, according to the report. On Feb. 15, Yu's mother called police to the family's home in Allentown, where they told both Esterly and his wife they had to stay away from the girl's home. The background and nature of the relationship between Yu and Esterly was not immediately clear. Yu is described as an Asian female, 4 feet 11 inches tall and weighing approximately 90 pounds. Esterly is described as a white male, 5 feet 9 inches tall and about 185 pounds. Anyone who sees the pair or has information on their whereabouts is asked to contact Allentown Police at (610) 437-7751.